Glenn Beck Fired. His New Replacement Will Be…. Home → Damien Zone → Glenn Beck Fired. His New Replacement Will Be…. Glenn Beck is out and Al Sharpton and Joyce DeWitt are in! Fox and Glenn Beck have come to a parting of the ways and a press release was issued wherein the Fox News Executives announced that Glenn Beck’s show — the one with all the blackboards and diagrams — will be shut off. Fox will air a new show in its place and this one will be hosted by Al Sharpton and former Three’s Company star Joyce DeWitt. 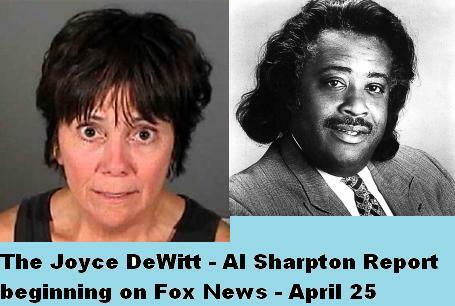 Starting next week, the “DeWitt- Sharpton Report” will air on Fox News at 5pm EDT. “We are looking forward to the huge success of the DeWitt-Sharpton Report,” continued Murdock as Bill O’Reilly cleared the table and brought out another cup of coffee for the mogul. “Joyce Landed herself in jail a few years back. There was some made-up story about why she was arrested but the truth is that she was hauled in by the Clinton Administration goons because her strategy against Al Gore was destroying Al Gore in the early polls back in the 2000 election. Joyce spent a night in jail for Fox News. You don’t see these Irish bastards like Hannity or O’Reilly doing that, do you? They better watchj their asses. So don’t forget to wach the new show on Fox News — and send Glenn Beck a sympathy card. How totally silly is this article?? No way!!! Beck had to go, but not for something like this. It’s not silly at all — everyone in the news industry already knows about this. you’ll see.